The Privateers Hurt My Head! I’ve been playing Shae’s tier list for about six months now so I decided to jot down some observations. 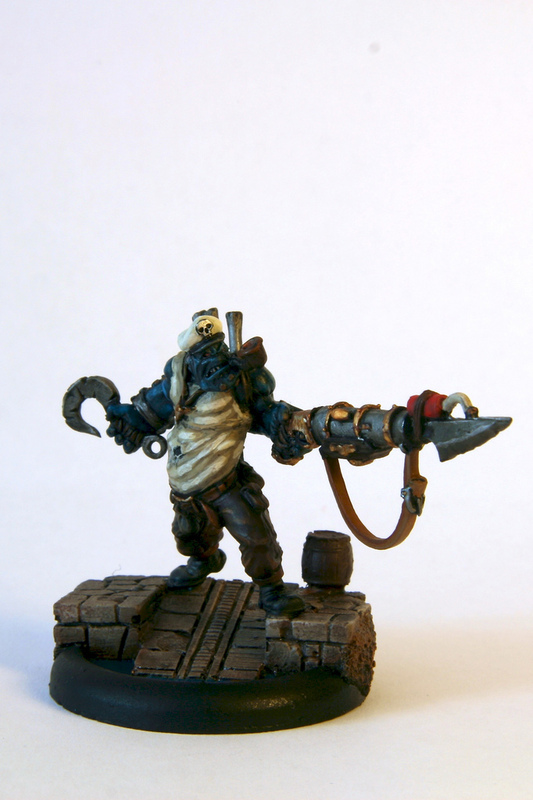 After coming from the relative simplicity of playing Khador the Privateers really challenged me. I’ve found three things needed to be mastered to get the most out of the Privateers – Synergy, Deployment and Activation order. 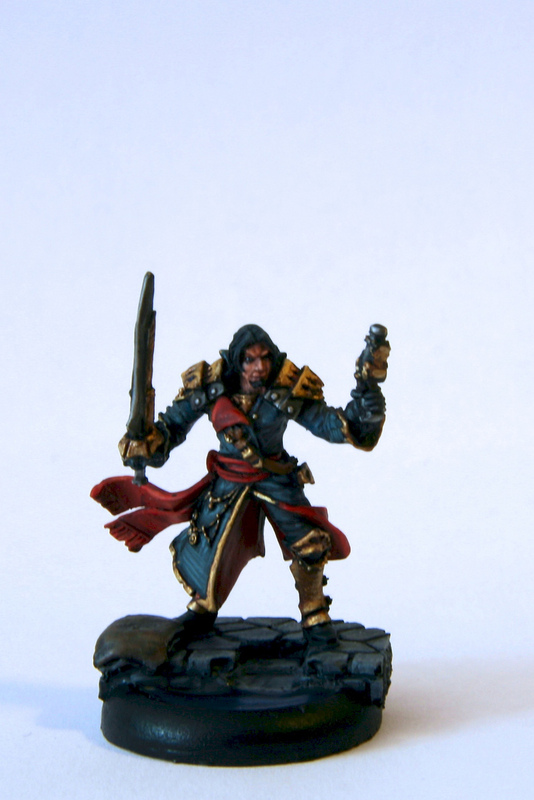 The same could be said for all armies, but I’ll focus on the aspects that are specific to these pirate scum. I’m not saying I’ve mastered the three things yet, but I at least know what I need to do now! In this article I’m not trying to replicate the Battle College articles on the topic, but here are some tentative lessons I learned playing the Talion Charter. There are an awful lot of interdependencies between the solos and Sea Dog Crew units, so you need to plan out what you want the achieve with them. The Sea Dogs are a pivotal unit and you want them to be mobile, hit hard and survive. Mobility is the area Mr. Walls helps out most. He gives them Pathfinder and +2 movement on the mini feat. Coupled with Shae’s movement enhancements this can get the Sea Dogs moving amazingly quickly. Shae’s feat, Godspeed, allows everyone to move up 3". This out of sequence move can get the army that bit closer to the enemy. His Coup de Main spell gives the whole army (or at least those starting a charge in his control area) another movement enhancement on the charge. Hitting Hard is the realm of Rockbottom and Hawk. Object of Desire coupled with Gang ensure the Sea Dogs can throttle troops. Rockbottom again can again help here with his coins. Mr. Walls helps a little with his once-per-game mini feat. This feat does several things, but in terms of hitting harder the Sea Dogs become Fearless and cause Terror. The former can really help when they’re going up against an Abomination or Terror causer. Survivability is primarily the role of Lord Rockbottom and Doc Killingsworth. Rockbottom can grant them tough and Doc makes that on a 4+. Bosun Grogspar has a role there too as he can ensure the Sea Dogs closeby cannot be knocked down. Shae’s Phantasm spell can help the survivability of anything it is cast on. There are other synergies worth mentioning. Dirty Meg, as a ‘jack marshal, can obviously take some of the burden of ‘jack control from Shae. This can free up some focus for other uses. Dougal MacNaile is someone I don’t have, but he can obviously enhance the accuracy of any ranged weapon. I’m sure there are more synergies, but these are the ones I use a lot! This is true for all armies, but the Privateers need to deploy with their synergies and potential mobility in mind. For example, with the Press Gangers and Sea Dogs (with Mr. Walls) advance deploying you have to ensure they don’t outpace Shae (specifically if he intends to cast Phantasm on one of the units). I tend to deploy Shae to the front of his deployment zone with a lane for him to move through. I usually activate him first on my first turn, sometimes even popping his feat for a little extra movement! Likewise the solos need to be placed for best effect. Will Hawk be supporting the Sea Dogs offensive output with Object of Desire? Or will she be running up a flank to attempt an assassination run? Similarly, you need to pay attention to Lord Rockbottom’s ability to give out coins in the first couple of turns. Doc and Grogspar should be in close proximity to the Tough infantry (Press Gangers and Sea Dogs with a coin from Rockbottom) and solos. Don’t forget the ranged elements of your army – the Mariner, Commodore and Deck Gun (which I don’t use!). They may need lanes to shoot through. The Commodore in particular is a great denial piece and keeping your own troops out of it’s way is important! This is the lesson that has taken me longest to get right. The basic rule is solos/Shae first, troops second. You need to think about what buffs, either offensive or defensive your troops will need. For example, I tend to think about what Shae is doing first, then Rockbottom, then the ‘defensive’ solos, then Hawk and finally the troops. Obviously the ‘jacks need to be considered here too. The reason this is important is that you want the units to have the buffs they need to hit with the maximum power. Rockbottom and Hawk help the troops to hit harder. Shae helps them to move faster (feat and Coup de Main) as does Mr. Walls. Doc and Grogspar increase survivability. The problem with all of this potential is that it is very easy to have units trip over each other! When they get in each others’ way they end up blocking charge lanes and fire lanes. This can be very frustrating and limits the punch, which can be formidable, of the army. Practice is the best way to mitigate this, but thinking about how you plan to fight your opponent will help – do you want to use Tough to ride out their offense (risky!)? Do you want to hit them with ranged attacks? If so, which ones? Is it all about the Sea Dogs’ charge? … and hundreds of other permutations. I don’t claim to be the master of the Privateers, but I’ve learnt a few lessons and hopefully you’ve found them useful. Just writing them down is useful for me (and helps my poor head)! Nice post. I did a HUGE post back in MK1 about all of the solos and how they interacted with the Pirates. By now the list seems really intuitive but at first it was a little complicated to wrap your head around. Any tips for keeping solos safe? Really cool article for someone like me, who’s looking at getting into Privateers coming from Skorne and Khador. It seems to me, if you’re activating the solos before the units (remember I’ve never actually played this army), you’ll run into issues. I imagine the solos hiding behind the units and buffing them as they move up and take hits (to keep the solos from being picked off too early). If you’re activating them first, don’t they get stuck behind the units as they can’t move through, and then the units outpace them when they move away? Not saying you’re wrong and the advice seems logical, I’m just trying to picture model placement that allows you to do this sort of thing well. Also, why don’t you use the Deck Gun? I mean, I’ve checked it out in the book but things aren’t always on the page. Did you find it’s not worth it’s points? @Mael No tips I’m afraid. I find Grogspar and Doc can die fast if you are too hasty with them. Their troop support is usually more important than any damage they can dish out. The same can be said of Rockbottom. Storm Rager on Hawk helps her survivability, but again a little patience can pay off. Acrobatics means she can get out from behind a screen to where she needs to be. @viperidae99 I rarely keep my units too tightly packed, so the solos can usually move up amongst them. There are usually only two turns (at most) before you engage the enemy for the first time. If your units are loosely formed, then Grogspar and Doc can move up amongst them. I usually keep Rockbottom in the backfield a little as he needs to spend his coins. They are usually spent in 2-3 turns, so he can join the fray then. Hawk never really has mobility issues, but she really needs to move up first if you want to get maximum value from Object of Desire. Of course, that is the ideal view. It’s okay to move Grogspar and Doc up afterwards as their buffs are mostly defensive. Ditto for Rockbottom if you are just granting tough. Meg, if she’s marshaling, usually operates as a separate ‘battalion’, so order of activation is only important with regard to the ‘jack(s) she controls. I’ve never used the deck gun as I don’t own one. I have no experience with it, so that’s why I didn’t talk about it.